Scrums: Qld 11-8. Penalties: NSW 7-2. 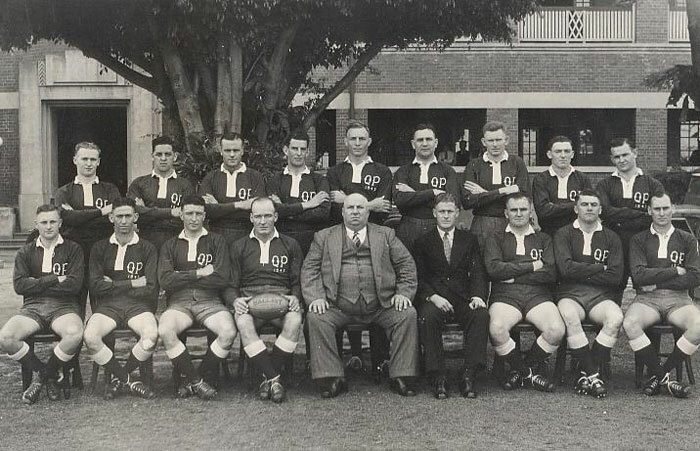 Standing left to right – Const Eric Deveney (1 – ), Cadet Eddie Otago (15 – Depot), Const Col Cowley (3 – Woolloongabba Transport Police), Const Jack Otago (6 – Depot – Clerical), Const Roy Shultz (11 – Ipswich), Const George Day (13 – Modus Operandi Section, CIBranch), Const Doug Millar (2 – Rockhampton), PCConst Athol Hogan (5 – Hospital Inquiries, Cairns) and Const Felix Creedy (14 – Townsville). Seated left to right – Const Terry Thomsen (7 – Roma Street, Brisbane), PCConst Iva Clark (4 – Brisbane CIBranch), PCConst Jack Clark (16 – Brisbane CIBranch), Const Eddie Brosnan (c) (9 – Woolloongabba), Insp Horace O’Brien (President and Patron – O/C Depot), Const Allan Kirkwood (Manager – Modus Operandi Squad, Fingerprint Section), Const Merv Callaghan (10 – Depot – Educational Section), PCConst Frank McNamara (8 – Brisbane CIBranch) and Const Stan Edmonds (17 – Nambour). Absent – Const Jack Black (12 – ).